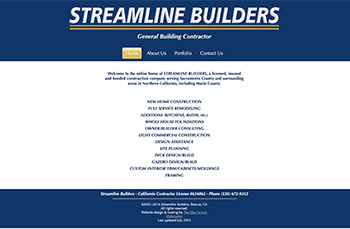 Streamline Builders is a Rescue-based licensed, insured and bonded construction company serving Sacramento County and surrounding areas in Northern California, including Marin County. Their craftsmanship is superb. Visit their website to see slides of their work. Their site was updated to to perform well on various size digital devices. Could your business use a website with a slide show of your projects or products to be viewed by computer, tablet, or smartphone? Contact us.